A few years ago, I was excited to acquire the Catalog of Playing Cards from Fournier, the Spanish cardmaker whose archive "must be the most numerous collection of its type in the world." The author, don Felix Alfaro Fournier, grandson of the founder of the press, claims his book to be "the most complete graphical repertoire of playing cards which has been published to date, with 4,000 illustrations in full color and 2,000 descriptions of packs." According to Fournier, early mentions of the Tarot in official documents first appear in Spain in the Municipal Archives of Barcelona in 1378. Unfortunately by 1382, card games were being prohibited by decree, first in Barcelona, then in Castile and Turia (Valencia). These warnings from the Church were meant to be taken seriously, following on the heels of the Albigensian crusade, waged from 1208 to 1229 by the Catholic Church against Cathar heretics affiliated with contemporary French and Italian papermakers and printers'guilds. It would not be surprising at all if the savagery and destruction that the Church perpetrated in the south of France a century and a half before had a dampening effect on the industry's freedom of expression in Spain. The Spanish never stopped playing the card games, however, and instead experimented with and developed a rich artistry in their cards. The Fournier chapter on the Spanish cards shows 923 packs of playing cards just in Volume 1! What it does not show is a single Tarot pack being published in Spain until 1900, the Catalan Taroccos, and that one was a remake of the earlier Etteilla Tarot from eighteenth century France. Considerable evidence tells us that the Spanish Jewish mystics kept in close touch with their colleagues in France, sharing considerable consensus in interpretation and practice of their common faith. This may have been the reason that a Tarot from France appeared that was drawn with Spanish art before the French produced a truly original deck of their own. Just as we do with images from Etteilla's Tarots, we have to take his writings with a grain of salt, too. On the faces of his cards, Etteilla printed various words, numbers, astrological glyphs and Hebrew letters, but they belong to the category of "veils" concealing his true correspondences. He was producing his works in a time when it was still necessary for him to disguise the content so as not to violate the boundaries set by the sources he was using or the oaths he had sworn upon becoming a Mason. In his books about Tarot, on the other hand, Etteilla passed on a body of astro-alphanumeric correspondences which he claims to have received from the Sephir Yetzirah of the Jews (see essay called "Kabbalah/Cabbalah"). We know now that he was dissembling on this point, because the astro-alphanumeric correspondences he used were actually a variant that had emerged with the Greek alphabet reforms of 600 BC. The confusion created by this misdirection has been a major obstacle that has deprived Etteilla of due credit for his contribution to Tarot history. The correspondences Etteilla published in his books are indeed related to the ancient Gra tradition detailed in Kabbalah by Gershom Scholem, but "related" does not mean "the same as." Etteilla was actually teaching the Hermetic/ Alexandrian variant, a later product of Pythagorean numerical mysticism. One could think of these correspondences as being Greco/Roman, a later development of the Hebrew pattern, itself derived from the Phoenician of antiquity. But the Spanish Tarot decks as a whole are not characterized by the Etteilla Tarot alone, borrowed as it is from France and a hundred years old already in 1900. The one truly original Spanish Tarot, which like all others was printed in this century, is El Gran Tarot Esoterico, commissioned by the Fournier card publishing company in 1977 to honor the six hundredth anniversary of Tarot's appearance in Europe. The Esoterico Tarot could be mistaken for a spin-off of the Marseilles Tarot to an unpracticed eye, but it is loaded with telling detail that links it with very ancient Hebrew legends about the Goddess, Eve, Sophia and the Wife of God (see essay called "The Gnostic Tarot"). Additionally, when the astrological sigils on the Majors and Minors of this deck are ana-lyzed, they correspond exactly to a pattern of astro-alphanumeric correspondences of origin in biblical times. This pattern, called the Gra arrangement of the Sephir Yetzirah, was written down in the first or second century AD, late in history relative to its true age. Evidence of its antiquity can be found in the fact that the Sephir Yetzirah was mentioned by name in the Talmud, which can be traced back to at least 300 BC. It is also true that Pythagoras, Greek number mystic of the 600s BC, studied with the Hebrews, adapting their number theory to his own. So again history tells us that the roots of this pattern are considerably older than any others, although Marixtu Erlanz de Guler, author of El Gran Tarot Esoterico, was the first to print them on a Tarot deck. Recent Hebrew scholarship from Aryeh Kaplan's The Sephir Yetzirah, published in 1990, highlights the reasons why the Gra version has to be at the root of the Hebrew alphabet mysteries (see the "Kabbalah/ Cabbalah" essay). This version has been confirmed in its authenticity and antiquity by no less a light than the eighteenth century Rabbi Eliahu, Gaon of Vilna, whose honorific, "The Gra," was given to his version. Aryeh Kaplan also reminds us that the Sephir Yetzirah is one of the primary ancient astrological texts, which strongly implies to me that its earliest form would have shaped a "world standard norm" from which future traditions would be drawn or against which later redactions (i.e., commentaries) would be contrasted. So whenever I see a Tarot using the Gra correspondences, and notice that it was published two decades before Aryeh Kaplan's definitive research proving the historical validity of its astro-alphanumeric correspondences, I sit up and take notice! Marixtu Guler, author of the Esoterico Tarot, clearly has her finger on a rich vein of esoteric, occult tradition in this Tarot. In light of what we now know, that the Etteilla cards were designed to be used with the Alexandrian/Hermetic astro-alphanumeric attributions (despite what he had printed on the cards), it is even more noteworthy that seventy-seven years later, after the Catalan Taroccos had become Spain's "traditional" esoteric Tarot, El Gran Tarot Esoterico would be prestigiously commissioned to represent an even older, more venerable and largely unsung set of attributions. This indicates to me that there was not as homogeneous a situation in the Spanish Secret Societies as on the rest of the Continent. One impression that is hard to miss with the Spanish playing card decks is that the Spanish culture has been the most multicultural, colorful and open-minded of all the European cultures when it comes to playing card imagery, especially the closer we get to modern times. People from Africa, China, the Middle East and the Americas appear in their native dress, right along with the expected Europeans, often standing for "the four corners of the world" through their suit attributions. Perhaps we should expect to see this variety since the path that papermaking took to reach Europe was from China via the Arabs, up through North Africa and into Spain. In these Spanish playing card decks, costumes are ornate, the figures are most often caught in various action poses (the Spanish royalty do not sit, unless astride a horse) and occasionally one of the royalty will suggest a Major Arcanum. The King of Cups often looks like a minor pope, while the King of Swords sometimes holds the crossed orb known from the Empress and Emperor Arcana. I am sure more resemblances could be found if we had the full decks to look at, instead of just a few "representative cards" from a catalog. This multicultural trend continued as new Tarots began to appear in Spain. What the Spanish lacked in Tarots before 1900, they make up for in the late twentieth century! The first seventy-eight card Tarot published in Spain, as previously mentioned, was the Catalan Taroccos, possessed of every feature that we would expect from an esoteric Tarot, although in an unusual arrangement. This deck demonstrates detailed and pleasing numbered Arcana inspired by classical archetypes, Hebrew letters, symbols purported to be Egyptian hieroglyphics, and in the case of the Minor Arcana, the faces of both the Catalan and French playing cards. Starting with this deck, all the Spanish Tarot images show the modifications we have come to associate with the Fratres Lucis Egyptian-style pictures first published on the Falconnier Tarot of 1896, as discussed in the essays "The Esoteric Origins of Tarot" and "The Continental Tarots." Perhaps the Spanish found the Catalan Tarocco uniquely satisfying, despite its unorthodox arrangement of the Hebrew letters on the (reordered Etteilla-style) Major Arcana. Or perhaps they were supplementing their experience with French and Italian Tarots that made their way in from abroad. We do know from books on Tarot published by Spanish authors at the beginning of the twentieth century, that the Falconnier Arcana (or some other source of Alexandrian-style Major Arcana) had appeared in Spain. We know this because we see their titles listed in a table in Pierre Piobb's Formulary of High Magic. This table, and an essay on the Minor Arcana by Eudes Picard, appears in The Encyclopedia of Occult Sciences, which was published anonymously in English in 1939. Both Piobb and Picard were originally published in the first decade of the 1900s, and can be found listed in the annotated bibliography at the back of Volume 2 of Kaplan's Encyclopedia of Tarot. 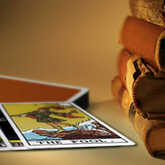 In this article on Tarot from the Encyclopedia of Occult Sciences, Picard's section is illustrated with the Minor Arcana from the Etteilla Tarot, although the descriptions make it clear that what he was writing about was acutally a deck much like, if not identical to, El Gran Tarot Esoterico. On the table from Piobb, the astro-alphanumeric correspondences given for the Hebrew letters are those used in Dali's deck and the Euskalherria Tarot, which are marked "as given by [Paul] Christian." (This is another reference to the Fratres Lucis manuscript that Christian translated and printed for the first time, although the correspondences on those decks are those of the Old Alexandrian stream.) The illustrations documenting these Major Arcana correspon-dences are made from an unnamed Spanish Marseilles deck. Talk about an eclectic mix of influences! With so many themes appearing in the literature about Tarot upon the appearance of the Catalan Taroccos, it is no wonder that no other Tarots were published in Spain for seven decades. The Spanish Marseilles emerged in 1975, based on the 1736 Italian-Piedmontese Tarot of Giusep Ottone. We know that the Marseilles family of decks consisted of "esoteric Tarots" not only because of the many artistic references within them to myth and magic, but also from the telltale changes instituted upon the Lovers and the Devil Arcana in the late 1600s (see "The Continental Tarots"). However, most Marseilles Tarot decks do not have any sigils or glyphs that indicate Hebrew letters, astrology signs or other overt occult correspondences. If one were just trusting in the momentum of "tradition" in Spain, one would expect the Spanish Marseilles to have correspondences like the Catalan Taroccos. But I am inclined to believe that the most common astro-to-Arcana correspondences used in Spain with the Marseilles cards, at least by the turn of the twentieth century, were the ones presented in Joseph Maxwell's posthumous book called The Tarot. These correspondences clearly aren't derived from Hebrew sources, but are just as decidedly linked to traditional portrayals of the zodiac, the planets and other mythic figures, partaking more of the nature of European pagan folk associations than true "occult" technology.
. I include these correspondences in this essay rather than in the Continental essay because it appears from the available evidence that the Spanish esotericists were the ones experimenting with various versions of the set published by Maxwell, while the French were sticking with those of Levi. One can see a version of Maxwell's correspondences on the illustrations included in The Encyclopedia of Occult Sciences (published anonymously in 1939), in the section about High Magic called "The Tarot, the Supreme Symbol." The Marseilles-style Tarot used as illustrations in the Encyclopedia of Occult Sciences as illustrations for the essay includes astrology correspondences clearly related to Maxwell's version, published after his death in 1938. Dali's Tarot and the Euskalherria by Marixtu Guler, both mentioned below, also uses these exact correspondences. 1976 saw the publication of the Balbi Tarot, a Marseilles offshoot using a body of Arcana/ astrology connections that's another variant of Maxwell's system. This deck gives us the most accessible and sympathetic esoteric Devil card (Baphomet) in my collection. Balbi's Arcana present a blended combination of complimentary and clashing colors, creating powerful optical effects when used for meditation and "scrying." They also look very lively when laid out for a spread. In 1977, on the six hundredth anniversary of the appearance of playing cards in Europe, Fournier commissioned the very first Spanish Tarot, the aforementioned El Gran Tarot Esoterico, created by Marixtu de Guler and rendered by Luis Peña Longa. This is the only Tarot I have ever been able to recommend to my Jewish students, who want a Tarot that will be respected by their rabbis. The fact that this definitive Tarot also has Minor Arcana that exactly match the essay on the Spanish Tarot written by Eudes Picard in 1908 gives us another assurance that El Gran Tarot Esoterico is not a "fad" Tarot. It would be so helpful if Picard's book, Manuel Synthetique et Pratique du Tarot were trans-lated into English with all illustrations repro-duced so we could study more about the Tarot situation in Spain at the turn of this century. In 1980 the English school was represented in Spain with the publication of the Hermetic Tarot by Godfrey Dowson. This Tarot is especially valuable for its inclusion of the spelling and zodiacal degrees of the zodiac angels, the Shemhameforesh, drawn from Old Testament sources and invoked through theurgy. Being of the English model, the angels are arranged differently on the suit cards than was traditional from the eighteenth century French decks that introduced them. The images seem strangely hallucinated, and the black-and-white format is a bit ominous compared to the brightness of other Spanish packs of cards. Also in 1980 the Secrets of Tarot deck was reprinted in Spain following a 1955 first edition in Italy under the title Il Destino Svelato Dal Tarocco (aka the Cagliostro Tarot). This deck presents the French School alphanumeric pattern, but with Alexandrian-style Major Arcana imagery. The images on these Arcana are adjusted to portray more female figures, in the spirit of the Etteilla and the earliest handmade Tarot decks. The pity is, the Minor Arcana look utterly unrelated artistically, have only a little character of their own, and are printed top and bottom with divinatory patter, also like the Etteilla Tarot. I am sure this defect affects the circulation of these interesting Arcana. In 1984 the Universal Dali Tarot emerged, created by the famous artist to please his Russian-born wife's love of the cards. In his Tarot he follows the alphanumeric pattern revealed in the Formulaire de Haute-Magie, published in 1907 by Pierre Piobb (a pseudonym of Comte Vincenti) and footnoted as being "according to [Paul] Christian." From this roundabout clue I assume that Dali (and Maxwell) were reproducing a pattern known by Christian to have been common in Spanish esoteric Tarots during the eighteenth century. The Dali Tarot, along with the aforementioned Balbi Tarot, show more alphanumeric relation to Joseph Maxwell's correspondences than to any other version. Artistically, the Dali Tarot shows a direct correlation to the Royal Fez Moroccan Tarot, which was commissioned in the late 1950s though not published until 1975. Imitating the Waite-Smith Tarot, the Fez Tarot has very similar pictures card for card, replacing the geometrical arrangements of suit symbols that were traditional. In that sense, the Dali could be considered a hybrid Spanish/English/ pagan Tarot. An interesting note on the Spanish Tarots is that the deck made by Augustus Knapp and Manly P. Hall in 1929 looks and feels distinctly like a Spanish Tarot except that the royalty are seated. These inspired versions of the Major Arcana display the Pope and the Charioteer in feminine form, like the oldest Gnostic-leaning decks. Yet Knapp and Hall employ the alphanumeric pattern of the Fratres Lucis archetypes, which seem to be the avenue through which the Pythagorean correspondences survived in Europe (see "The Continental Tarots"). This makes the Knapp-Hall Tarot a scholarly splice between the Hebrew Gnostic and the Pythagorean streams coming from antiquity. A modern Tarot with the Hebrew (Spanish) correspondences of the Gra is the Tarot of the Ages. This looks like a divinitory deck because every one of the suit cards is illustrated with a scene of human experience instead of showing geometrically arranged suit emblems as El Gran Tarot Esoterico does. The Major Arcana look Egyptian (modern interpretations of the Falconnier Tarot), but the astrology is old Hebrew. Nowhere is it explained why this combination of images, correspondences and cultures was chosen, but that is not a defect because all the imagery makes the deck more accessible to beginners. The fact that it matches El Gran Tarot Esoterico, though the two appear to have no direct relation to each other, seems to mean that the world of Tarot is maturing and becoming more scholarly about our traditions, even in decks prepared for the mass market. This is a development we can all applaud! More could be written on the Spanish Tarot stream, especially as it concerns the cultures of Mexico, and Central and South America. Kaplan's Encyclopedia shows that versions of the Alexandrian, Etteilla and Papus Tarots have remained popular among Spanish speakers of the world, despite their lack of commercial impact in North America. More research is needed to put this fascinating and eclectic group of Tarots in proper perspective relative to the larger history of Tarot.